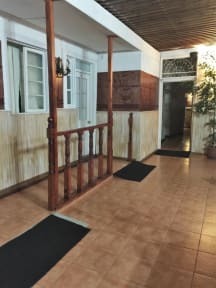 Hostal Villanueva i La Serena, Chile : Boka nu! Hostal Villanueva is located in a building where the mix of classic Baroque colonial style stand out being this a typical house with Colonial architecture, remodeled to give a cozy and familiar atmosphere to its guests. We have a vast experience in the hospitality sector, an element that we capitalize to bring the very best possible experience to our guests and travellers within our facilities. We are located in one of the best areas of the city, near to some of the finest and most renowned attractions and landmarks of the city such as Botanical Garden, Plaza de Armas de la Serena and Faro Monumental, amongst other interesting places and spots of our city. We have two rooms, one double room ideal for couples and one room perfect for those venturesome travellers that are travelling on budget. All the rooms are fully equipped with all the necessary services and amenities to guarantee a great stay to our guests and travellers. In addition, we have several common areas where our passengers can get together and exchange past experiences and future plans.